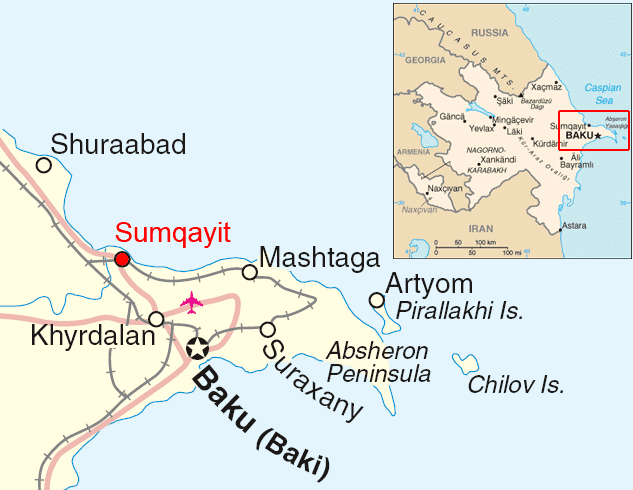 Sumqayit (Azerbaijani: Sumqayıt, also transliterated as Sumgait or Sumgayit) is the third-largest city in Azerbaijan, located near the Caspian Sea, about 31 kilometres (19 miles) away from the capital, Baku. The city has a population of around 298,000, making it the third-largest city in Azerbaijan after the capital Baku and Ganja. The city has a territory of 83 square kilometres (32 sq mi). It was founded on November 22, 1949. Two settlements are within the city administration: Jorat and Haji Zeynalabdin, a settlement named after oil businessman and philanthropist Haji Zeynalabdin Taghiyev. It is home to Sumqayit State University. According to the local folklore the city is named after the Sumqayit River. In retrospect the legend tells the tale of a hero by the name of "Sum", who is chosen by the community to fight a monster that was blocking the Sumqayit River. Sum eventually manages to kill the monster, but when the river is released he is swept by the waters and never seen again. After that, his beloved, Jeyran, inconsolable by Sum's disappearance, would go to the river and cry "Sum qayıt!" (which means "Sum, come back!" in Azerbaijani). So the river became known as Sumgayit, upon the city was named after. According to historians, Medean tribes lived in the area. During the construction boom, when the foundation of the executive power building was being excavated, remains of an ancient caravanserai along with personal items and kitchenware was found at the site. The first reports of settlements at the present site of Sumgayit were in 1580, when English traveller H. Barrow mentioned Sumgayit in his writings and in 1858, when Alexander Dumas wrote about the area in his memoirs Trip to Caucasus, although nothing substantial was created on the site until the Soviet Union gained control over the area in the 1920s. Following the politics of glasnost, initiated by Mikhail Gorbachev, civil unrest and ethnic strife grew in various regions of the Soviet Union, including Nagorno-Karabakh, an autonomous region of the Azerbaijan SSR. On 22–23 February 1988 violence broke out in the town on Askeran, resulting in the death of two Azerbaijanis. The news of the Askeran clash along with ongoing deportation of Azerbaijanis from Armenia sparked the Sumgait pogrom against Armenian residents of Sumgait in Azerbaijan on 27 February. The violence was led, to some degree, by Azerbaijani refugees from Armenia, perhaps as many as 2000 of them made even more desperate by being forced to take shelter in the appalling conditions of Sumgait's shantytown. The pogrom resulted in the deaths of 26 Armenians and six Azerbaijanis. As a result, the entire Armenian population fled from Sumqayit. The violence during the Askeran clash and the Sumgait Pogrom marked the starting points of Armenian-Azerbaijani conflict, which triggered the Nagorno-Karabakh War. After Nagorno-Karabakh War, the city became home to a number of Azerbaijani refugees internally displaced persons, mainly from Qubadli and Zengilan regions. In 1994, Heydar Aliyev initiated a large-scale Free Economic Area project on the territory of the city. As a result of the Soviet planning of the industrial boom era, the city became heavily polluted. Soon after Azerbaijan's independence, the industrial sectors went into decline. The Absheron Peninsula (which consists of Sumqayit, Baku and the Absheron Rayon) was considered by scientists to be the most ecologically devastated part of Azerbaijan. The city was known for its children's cemetery, known as the "Baby Cemetery" which contains many graves of infants born with deformities and mental retardation that were further complicated by the lack of adequate medical care for the poor. 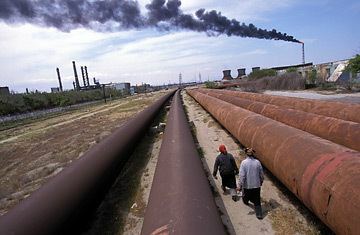 Sumgayit was named as most polluted place on Earth by the U.S.-based environmental group the Blacksmith Institute in 2006 and placed on their list of The World's Most Polluted Places by Time magazine in 2007. The report noted the former Soviet industrial base was polluting the local environment with industrial chemicals like chlorine and heavy metals. The report also mentioned cancer rates in Sumgayit were as much as 51% higher than the national average and that genetic mutations and birth defects were commonplace. The city administration prepared an environmental protection plan for 2003–2010 which has been steadily decreasing the levels of pollution to minimal. The program oversees 118 activities aimed at minimizing pollution at all possible levels of economic production. The program was prepared with participation of all industrial enterprises in the city and its enforcement is being regulated by the executive power of the city. For instance, the amount of waste water from industrial production went down from 600,000 m3 (21,000,000 cu ft) during the 1990s to 76,300 m3 (2,690,000 cu ft) in 2005. Solid waste went down from 300,000 to 3,868 tons a year. The World Bank has issued a loan to the Azerbaijani government for construction of a burial range for mercury waste. The municipality of Sumqayit consists of the city of Sumqayit and the municipalities of Jorat and Haji Zeynalabdin. The mayor, presently Eldar Azizov, embodies the executive power of the city. Until the events of the dissolution of the Soviet Union it was home to 20.000 Armenians, who as a result of tensions and war were displaced as refugees. Sumqayit did not have a mosque until after the collapse of the Soviet Union. In the 2010s, the city has emerged as a center for Salafism in Azerbaijan, a form of Sunni Islam that advocates a return to Islam’s earliest practices. The Syrian Civil War and emergence of ISIL forced authorities to take action on crackdown of perceived religious radicals in Sumqayit. In 1935, the Soviet government decided to develop heavy industry in the Absheron Peninsula, and the future location of Sumgayit was chosen based on its proximity to Baku and its key position on existing railroad lines. Between 1938–1941, a thermal power station was constructed to power Baku's growing petroleum industry. This was soon followed by more heavy industries. Due to World War II the construction of the area stopped and resumed in 1944, when metallurgical and chemical plants were constructed and put into operation. The first production of Sumgayit Chemical Plant led to a rapid growth and construction boom, creating a new job market, and a need for a resident population. In 1949, Sumgayit gained official city status according to resolution of the Supreme Soviet of Azerbaijan SSR. In 1952, a tube-rolling plant delivered its first produce thus developing black metallurgy production in Azerbaijan. The same year, another new Synthetic Rubber Production Plant started its operations producing ethylene obtained from oil. Operations at Sumgayit Steel Processing Plant and Sumgayit Aluminium Plant were commenced in 1953 and 1955, respectively. In 1957–1955, a number of scientific research facilities and cultural centers were built, leading to further development of the city infrastructure. In 1960, authorities started building the Petroleum Chemical Factory, the largest in Europe at the time. From 1961 through 1968, a brick-producing factory, a polymer construction materials industrial complex, a phosphor production plant were built. In 1970–'80s, light industry and mechanical engineering facilities were added to the industrial base of the city. By the end of the 1980s, Sumgayit was already the center of the chemical industry of the USSR. After the dissolution of the Soviet Union, Sumgayit has remained Azerbaijan's second-biggest industrial center after Baku. Some of the most significant companies operating in the city are Azerpipe, Azeraluminium, Sumqayit Aluminium, Sumqayit Superphosphate, glass producer Khazar OJSC, Sumqayit Knitted Goods Factory, and Sumqayit Compressors, many of which have been privatized. In 2011, the development of Sumgayit Technology Park (STP) and Sumgayit Chemical Industrial Park (SCIP) started to receive investor attention. The 167-hectare (410-acre) complex will host pharmaceutical, construction, and agricultural businesses, in addition to chemical, automotive, and electronics producers. It is meant as a self-sufficient complex, which will include residential facilities, an exhibition center, laboratories, sports center, schools, and hospitals. SCIP aims to attract domestic and foreign investors, and its management has already received proposals for 20 investment projects in the complex. The first studies in architecture and urban planning of the city of Sumgait were carried out by Azerbaijani and Soviet scientist, academician of the International Academy of Architecture of the Eastern Countries, honored architect of Azerbaijan SSR Kamal Mammadbeyov. The result of years of research were numerous scientific publications and a book about architectural and planning development of the city of Sumgait. Mammadbeyov donated a large number of graphics and illustrations made by him to the archives of The City Museum. Sumgayit was credited as the main regional driving force behind rock bands of the 1990s including Yuxu, Miraj, Mozalan, and Sirr. The regional channel Dünya TV and newspaper 365 Gün are headquartered in the city. During the Soviet rule of Azerbaijan, Sumgayit was believed to have the longest and cleanest boulevard in the republic. The Culture and Leisure Park was laid on 23 hectares (57 acres) of Sumgayit coastline in 1967. On August 17, 1978 the park was given the name of a distinguished Azerbaijani poet Imadaddin Nasimi. The same year, the city administration raised the Peace Dove monument in the middle of the park assigning the city a symbol of peace. The flora of the park includes 39 types of trees. Events of the 1990s such as the Black January tragedy and Nagorno-Karabakh War, led to establishment of Stars (Ulduzlar) and 20 January Monument monuments in the park. In the eastern section of the park, Shehidler Khiyabani similar to Martyrs' Lane in Baku was established as burial ground for thousands of soldiers from Sumgayit who died during the war. According to the Decree No. 132 of the Cabinet of Ministers of Azerbaijan dated August 2, 2001 the park was given the status of national historical importance. Its current size is 80 ha. In addition to Nasimi Culture and Leisure Park, the city administration built Ludwigshafen Park in 1997 in celebration of the 20th anniversary of twin-city relations between Ludwigshafen and Sumgayit. In 1999, Heydar Aliyev Park and Luna Park were built in the rapidly growing city. The city has one professional football team competing in the top-flight of Azerbaijani football – Sumgayit, currently playing in the Azerbaijan Premier League. Sumqayit has a large urban transport system, mostly managed by the Ministry of Transportation. The city had a tram system that functioned from 1959 to 2003. Ganja's trolleybus system at its height, it consisted of eight lines and existed until 2006. In 2013, Ministry of Transportation stated that city, along with Ganja and Nakhchivan will have new subway line within the framework of the 20-year subway program. As of 2011, Sumgayit boasted 49 schools, 13 vocational and music schools, Sumgait Private Turkish High School and a teachers' institute. The only university in the city is Sumqayit State University. The university has seven departments and approximately 4000 students. Some of the city's many prestigious residents include: chess players Shakhriyar Mamedyarov and Zeinab Mamedyarova, balaban player Alihan Samedov, footballers Nazim Suleymanov, Kamal Guliyev and Mahir Shukurov, Ilham Zakiyev, two-time world and five-time blind judo champion and two-time gold medalist in the paralympics and karateka Rafael Aghayev. Archbishop Pargev Martirosyan the current Primate of the Diocese of Artsakh of the Armenian Apostolic Church is also from Sumqayit.